Strike a pose with the bobble-headed 2017 World Series champion Houston Astros at the History Earned mural in the Heights. Located on the side of Sublime Heights on 20th, the History Earned mural is the perfect spot for folks to snap a photo while celebrating our boys in orange and blue’s historic 2017 win. The creation of artist, writer, sculptor, and teacher “Skeez181” (@skeez181), the Houston muralist has been spray painting artworks for nearly three decades and is influenced by ancient Aztec hieroglyphics, futuristic imagery, and graffiti. 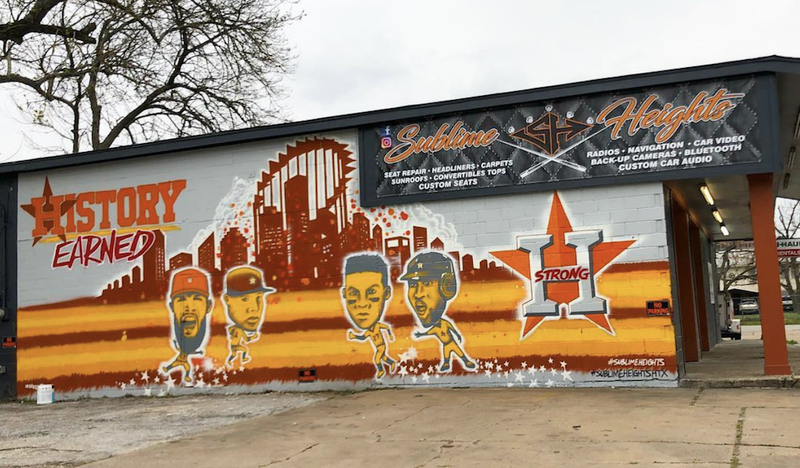 The spirited mural, which features bobble-headed depictions of José Altuve, Carlos Correa, George Springer, and Dallas Keuchel, can be easily spotted on the side of the upholstery/car stereo shop. Visitors should note that during the week Sublime Heights is liable to have cars parked near the wall. That said, the best time to photograph is on the weekends when the business makes sure the wall is unobstructed for picture taking. And if you’re sticking around the area, check out other area favorites and must-dos. There are plenty of other parks, bars, restaurants and more, just waiting to be discovered around the corner. Hours: Open daily sunup to sundown. Arguably the best time to photograph the mural is on the weekends when the wall is kept unobstructed for the sole purpose of picture taking.